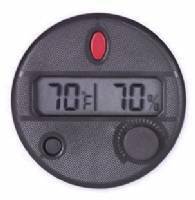 Never wonder again if your digital hygrometer is accurate! 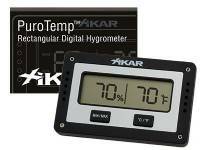 The Adjustable Hygrometer is the first digital hygrometers capable of being adjusted after calibration. Available here in a rectangular shape. Simply perform the 75% salt test using Humidipak's One-Step Calibration Kit. When you adjust each click of the adjustment knob changes the humidity displayed by 1%, press the set button, and your Adjustable Hygrometer is calibrated and ready to go! Click on "Details" for full instructions. Size: 2 3/4" x 1 3/4" x 1/2" thick. Includes a self adhesive magnet for mounting the hygrometer to the inside of your humidor. The hygrometer displays in either Fahrenheit or Celcius, your choice. You can add a Boveda Calibration Kit to your Hygrometer order for just $3.25 more, normal price for the Calibration Kit is $4.97. 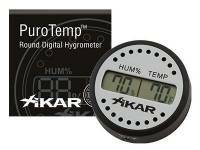 The Adjustable Hygrometer is the first digital hygrometers capable of being adjusted after calibration. Available here in a round shape. Size: 1 7/8" x 1/2" thick. Includes a self adhesive magnet for mounting the hygrometer to the inside of your humidor. The HygroSet® FM has the same great adjustment features as the HygroSet® I and II but is made specifically for exterior front mount humidors. The HygroSet® FM is capable of being adjusted after calibration. Each click of the adjustment knob changes the humidity display (+ / -) by 1%. We recommend performing the 75% salt test using Boveda Calibration Kit. Adjust to the correct humidity, press the set button, and your HygroSet® is calibrated and ready to go! Note: The HygroSet® III is specially made just for exterior mount humidor models. Click on Details for Calibration Instructions. 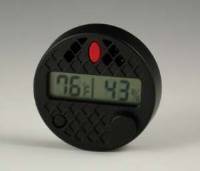 The DHYG-SL digital hygrometer accurately measures and displays relative humidity and temperature to assure your cigars are stored in ideal conditions. Measures 4" x 1-1/4" x 1/2"